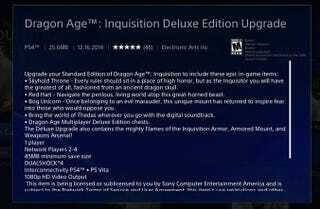 Anyone Want To Vouch For This $10 Dragon Age: Inquisition Upgrade? Owners of the "deluxe edition" of Dragon Age: Inquisition, have you sat on the Skyhold Throne or ridden the Bog Unicorn? Standard edition schlubs like me can now buy the deluxe edition's extra content (listed above) for $9.99 today. I'm thinking this is a pass. But if you have this stuff and think it's worth it, speak now! Thanks.